Legs lagging? Wheels out of air? 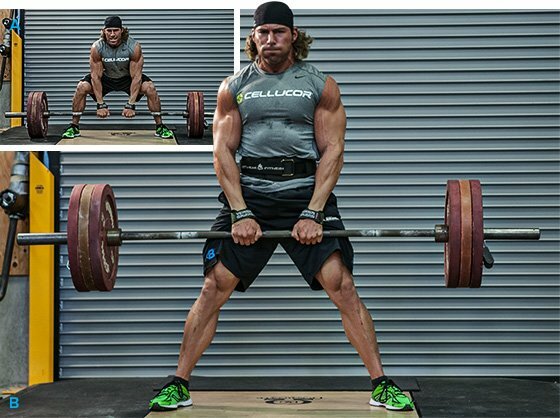 Kick your lower body development into overdrive with Craig Capurso's heavy volume workout! Leg day is my favorite training day, and my favorite way to train legs is with heavy volume training (HVT). HVT doesn't sacrifice intensity for volume. It combines high volume and heavy iron. The results are as extreme as the workouts. I've been lifting since I was 12 years old, and I've been working legs like this for years. I like to push myself, and so should you. To have a fully functional body, you have to train basic lifts with extreme intensity. Heavy volume applied to compound exercises helps me recruit as many muscle fibers as possible. Compound movements like the sumo deadlift—the foundation of this workout—incorporate more muscles to recruit more muscle fibers in each lift. Give my HVT legs workout a shot and get ready to grow! This workout starts with heavy volume sumo deadlifts. You have to perform 100 heavy reps in as few sets as possible. If you're a new guy to the gym or you haven't done sumo deadlifts before, spend extra time warming up. Practice with as many sets as you need to master the correct form, and then hit it! I usually just warm up as a form check, saving most of my energy for the main event. With the sumo deadlift, you're going to fail. Your body is going to lock up and your lower back is going to get tight. Your first set is going to hit a helluva lot more reps than your second and third sets. That's OK. Keep pushing. Sumo deadlifts incorporate your legs and your back. Your legs may have more juice than your back, or vice versa. Different body parts will give out first. Stop each set when your body shuts down. Stop when you can't exert anymore. Stop when you feel like that next rep might put you in a precarious position to injure yourself. Put the bar down and take your rest, and then resume the attack. After completing 100 reps, move into supersets. Warm up with a few reps of each exercise. Short warm-up sets will help you determine which weight to use. You should fail at the specified rep range, so make sure you pick a challenging weight. On the single-leg leg press, alternate legs as you proceed: left, right, left, right. Position your legs as if you were doing the double-leg leg press, then just pull one leg off and do it. The second superset hits your quads and posterior chain. You target quads with leg extensions, and then shift your focus to hamstrings and glutes with the kickbacks. The final superset is a powerful gut check. Lift hard and power through! If you're totally gassed, rest between reps during the set of Smith machine calf extensions. Take as much time as you need and do whatever it takes to hit 30 reps.
Craig Capurso is a Wall Street oil trader, IFBB Pro physique competitor, Team Bodybuilding.com spokesmodel, Cellucor athlete, and fitness model.